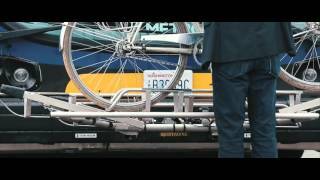 Motivated by the need to extend capacity beyond the bus front, the Interlock™ is an ideal solution for safely transporting bikes inside transit vehicles. The InterLock™ interior bike rack was designed with a unique front and rear wheel securing system that is fast and easy to use. Considered a semi-custom design, the InterLock™ can be adapted to an array of interior transit vehicle locations, and easily stores out of the way when not in use. The InterLock's simple, intuitive design requires minimal lifting and allows for two-handed contact on the bike at all times. The rack efficiently stores bikes to minimize aisle interference when in use, and produces minimal lateral movement even during quick stops and hard turns. The InterLock™ is the ideal choice for public transit vehicles (including rail cars) when additional bicycle carrying capacity is required. For detailed product specifications including dimensions, weight capacities, safety, construction and operational information, please see the InterLock Spec Sheet (.pdf) available under Downloads on this page.